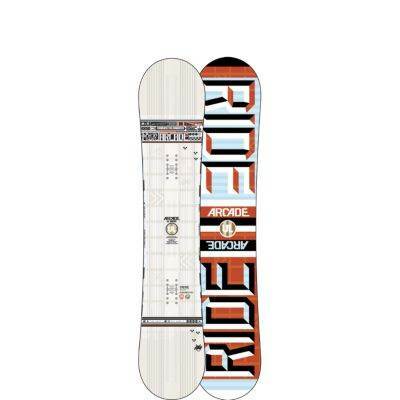 The Ride Arcade UL is rides high end super snappy aggressive all mountain freestyle twin. 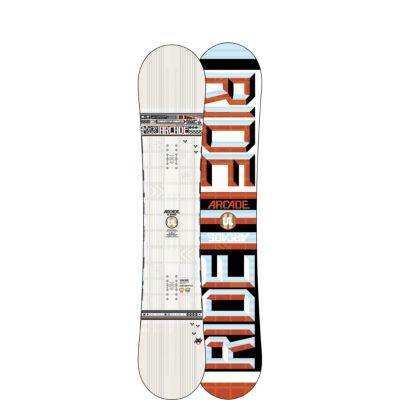 Ride has two tiers of board. They have the regular series and the Ultra Light series aka UL series. Almost every UL series board we have tried we like and the UL is no exception. Ride’s hybrid camber is not like many of the other hybrid camber boards out there. Most are mostly rocker or mostly camber hybrid shapes. Rides hybrid camber is mostly flat with equal but small parts of camber and rocker in the board. Their is a very small camber shape between the feet to create stability, increase edge hold and add some pop. When you press down there is a bit of a lift in the nose and tail. 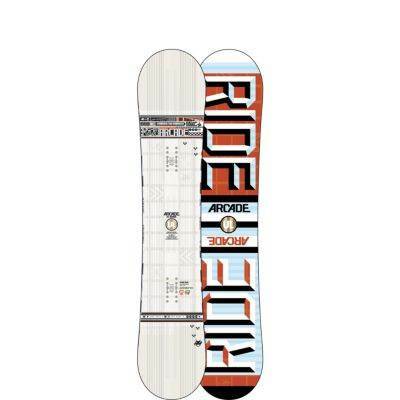 Despite the mostly flat profile with the Arcade we felt this was a very lively and playful all mountain freestyle board and one of our favorite boards we tried this year with ride. This is for a rider who wants to go big anywhere on the mountain and likes a lively feel. So here is our take on the Arcade UL which is pretty much a hybrid camber version of the old Society UL Camber. Groomers– Even though this is a freestyle twin we had a blast on groomed runs at any speed. This is where the All mountain in the All mountain freestyle rating comes out. Switch or regular it was a blast. We found that we felt more comfortable at higher speed switch than we normally do. Powder: The Ride Arcade is a twin with a centered stance and although it’s mostly flat the camber that runs through most of the board makes point a slight bit down. The tip/tail that points up early helps this float better than a camber but its not going to compete with mostly rocker shapes out there. Still this will be fine in shallow or light powder but if you ride in a lot of deep powder this will be a lot more work to stay afloat. Turn Initiation and Carving– The Arcade was very lively and fun to engage a turn with but it wasn’t totally easy. This we both felt was very good. This could transition from edge to edge pretty fast and it was fun to make short or wide radius turns. This had a very camber feel to it when it came to turns. When it came to carving the Arcade was really fun for a twin and you could lean into a carve as hard as you wanted without it washing out. It’s not going to have that magic that many directional boards of the same flex have but it’s great for a twin. 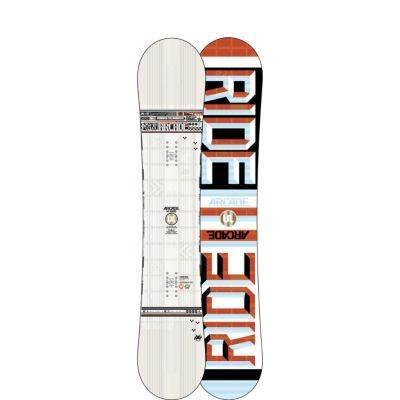 Speed: This is a Medium to Stiff board, with a fast base and damp ride. That equals a fast board which is quite a surprise for a twin in this category but it’s kind of expected for the price. It’s not going to take down a Never Summer Raptor or Arbor A Framebut it’s one fastest true twin’s we have ridden and that is why we feel it’s excellent at speed. Weight– This is super light compared to most boards out there. It’s not as light as the Burton Vapor but it’s in it’s class. There seems to be almost no topsheet there which makes you worry about longevity. 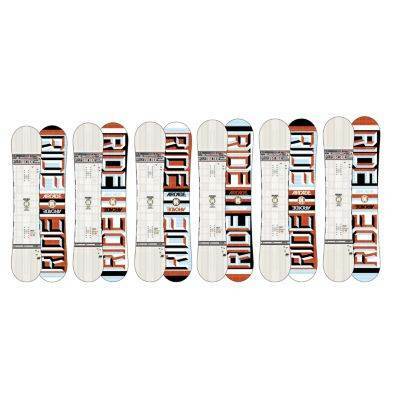 Ride always makes long lasting boards so don’t stress too much about the thin topsheet. Edge Hold: We both were a little surprised here when it came to edge hold. We thought there would be border line excellent to excellent but instead it was somewhere in between average to good. It still held an edge very well in the medium to hard conditions we were riding in but when we found harder patches we weren’t terribly comfortable leaning into a turn. We wouldn’t want to take this out on a snowment to icy day. Flex: This is rated at an 8 out of 10 but it didn’t feel that stiff. It just felt like an average med/stiff board. Jibbing– This isn’t a jib board It’s made for aggressive mountain/jump/pipe play and it is pretty stiff for slow speed jibs. Pipe: If the edge hold was a little better this would be an excellent pipe board. Still this is really fun in the pipe. Jumps: The Arcade was very springy and it generated it’s own air very well. We felt this was one of the poppiest boards Ride makes. We don’t really go big but we had fun on natural to medium park jumps and felt this is a great jump board. Our overall impression was this is a great board and our only drawback was the price. 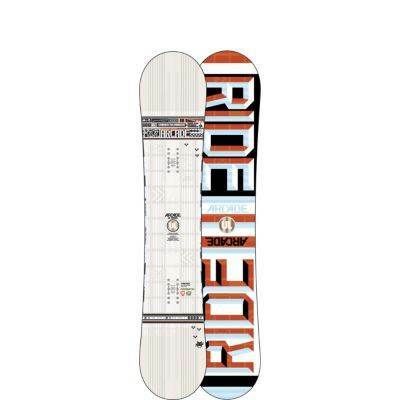 We felt that there are many boards out there that ride like this for $100-$150 less which was our only real complaint. We’d like to see Ride say f—k it and just add this UL tech to all their mid level boards like the DH and Machete. 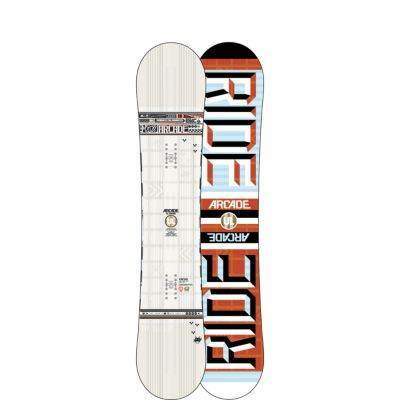 Still this is a great board and will be great for that person who likes jumps in the park, finding cat tracks/natural terrain to launch off, riding fast switch or regular and hitting the pipe when the conditions are good. We try to get as many images of the Ride Arcade UL, but forgive us if they're not all there.